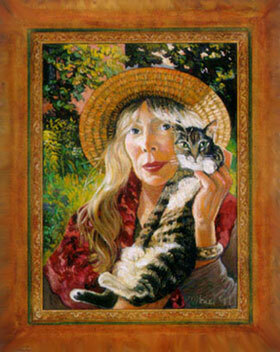 Looking for a new pastime, I asked about the painting nearby, a self-portrait in a wide-brimmed hat, holding up one of her cats. She had made herself look older in the painting than she actually appears, softening her jaw and deepening the lines in her face. She's not big on vanity. In June, I made my way back to Mitchell's L.A. house on the hill. The jacaranda was blooming, and she was waiting in the door of her hacienda wearing old clothes in which she'd been painting - a pale striped T-shirt, a denim jacket, white jeans, and sandals. Hanging on the wall in the alcove was the self-portrait with cat that she was working on during my first visit. She had modified it to mark the change from winter to summer: in the new version, Mitchell's hat and shirt were lighter colors, the sky behind her was a brighter blue, and she was standing in front of a paler wall. Maybe good fortune had started to sink in. I think this is the album cover, she said, but had no idea what to call the album. "So what's the painting called?" I asked. Staring down at the canvas, she decided: "I think I have to call it The Lion Tamer." "Now I'll have to write a song called 'The Lion Tamer,"' she said as we returned to the studio, where she picked up an electric guitar. In loose slacks, a turquoise pullover, and soft boots, she worked beneath two antique photographs of some stern Native Americans who shared her cheekbones. She was hitting foot pedals, playing with a distorted guitar tone. "We know how to swing," Joni said, nodding to her new partner, Brian Blade, behind his drums. "Now we'll see if we know how to rock!" She made three passes at a rhythm track, each with a different attack, then listened and chose the second take. Her engineer mentioned that it sounded like Led Zeppelin. "More like a lead balloon," Mitchell cracked. CD: The title of the album, "Taming the Tiger," is also the title of one of the songs on the album. I haven't seen the cover of the album, but I suspect that it's a painting of yours. JM: Yeah. There's a lot of paintings on the cover this time. CD: Okay. Is the painting "Taming the Tiger"? JM: Well, kind of loosely. It's just a picture of myself and my cat, El Cafe, who is one of my dancing cats. JM: Along with Nietzsche. They don't dance together. It's two different kinds of dance. El Cafe is a wrist-rider. She's kind of an equestrian. CD: (Laughs). She rides your wrist? JM: She rides my wrist, yeah. She neck-reins (laughs). But anyway she's reclining kind of like Cleo and she's got a kind of Jack Benny look on her face and like, you know, like Cleopatra on the Nile lying in my arms, and it's kind of a, you know, kind of a cozy portrait, you know. 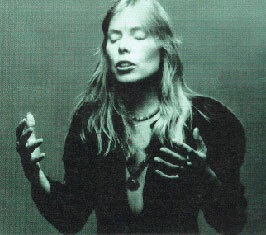 I love this picture of Joni and her cat! She looks so at peace and enjoying life! I just look at it and give a big SMILE!